I was pretty shattered when I woke up on Sunday. I don't think it was from being out the night before but because I was due my period. I only started having one again the last few months and I think my body is still getting used to it. Either than or perhaps feeling drained is just how my body feels around that lovely time of month. Thankfully I wasn't in a lot of pain so after my fry I got ready to go visit my granny. I was so excited as I hadn't seen either of my grandparents in about four months. It was the longest I'd been without seeing them because of my granda's pneumonia and my family and granny adjusting to my granny now living in a care home. I'm not going to lie, I was nervous going to visit her. With her Alzheimer's I wasn't sure she'd even remember me. Plus since moving there she spends most of her time in the lounge and I was nervous of being around all the other people in the home. I know that sounds terrible but it wasn't anything personal in relation to them. I'm the same in any new and unknown social situation. When we got there my granda and aunt Karen had arrived already. They had no idea Jann was home so it was a nice surprise for everyone to see her. Granny was in her room for once and thankfully she recognised us all. The home is pretty standard from what I've seen. If you've ever been in one you probably know they all look pretty much have the same layout but everything was nice, bright and fresh looking. They also had a lot of vintage items and photographs in all the little reception areas and the walls. My granny was in great spirits and chatting away as usual. 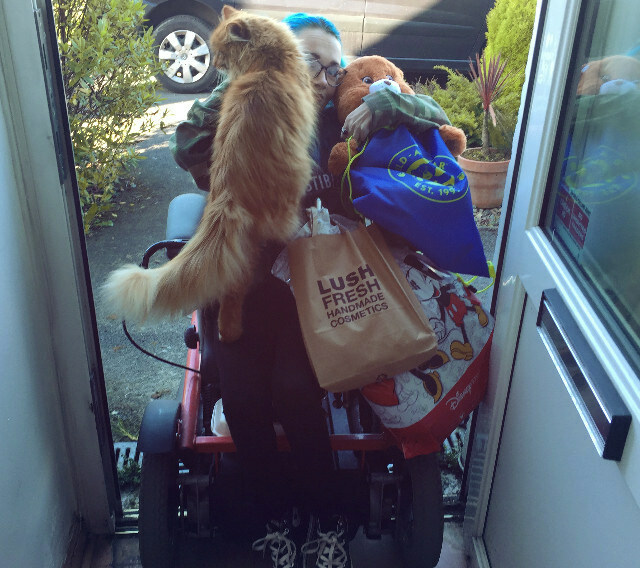 It was really great to see her settled and as much as we never wanted her to end up in a care home, I'm glad she's in a place we can feel good about. As usual she was asking us all if we have boyfriends yet. I wish I didn't have to disappoint her with a no, but luckily Jann gave us someone to talk about with her dating a doctor. Granny was pleased with that. I'm hoping now that I've been I'll get to go more often to see her. I definitely won't be leaving it four months again. We took some photos with her but I don't feel right including them without her consent, but I will definitely cherish them. I really wish I had taken more photos with my grandparents over the years. On our way home we stopped off to get a Starbucks coffee to takeaway. I wanted to get out of the car and have a look in Tesco to get something yummy to have with my coffee but I also wanted to check out their toy isle. However Jann wanted to get home as she had to finish something for university. I was bummed out I had to stay in the car with my dad while Jann and Eva got out. I don't think most people would see the big deal but when you know the only reason you can't tag along is because it's too much time and effort to get you out of the car it's a little frustrating. When we got home Jann got to work on her university stuff and Eva and I chilled together. We ate some ready meals I'd bought that were about to go off and after that I did a little bit of blog work until my aunt Karen visited later that evening. 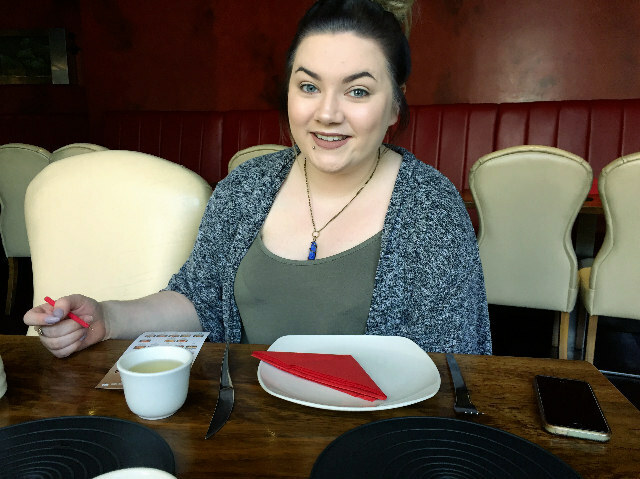 We planned to get some takeaway and have dinner together so she could have a catch up with Jann. We were also going to watch a film but that never happened. We just chatted. Later in the evening we did our own thing. Eva and I chilled online and watched YouTube videos. We ended up staying up late checking out Breyer Horses, our new obsession. However, with my birthday coming up I refrained from ordering any. Monday was the release day for the book I'd reviewed earlier in the week. If you haven't checked out my Bloo's Review of First and First by Santino Hassell then you can find it here. I can't recommend it enough! On Monday I had planned to go up to Belfast with Jann and Eva to get lunch and then do some shopping for my birthday. I'd had a hospital appointment but I'd cancelled since Jann was home. However, I decided to cancel the Monday shopping spree as I felt like it would be too much of a rush for Jann to get to the airport. Plus she isn't really interested in toys like Eva and I so the shopping trip would have been super boring for her. So we postponed it until Wednesday, my actual birthday. Rather than Belfast I had suggested we go into town to get a coffee as Jann had mentioned she needed to go to get something before heading home. However when I woke up Jann had already left. I had breakfast with Eva and when Jann came home we discussed what we should do. She didn't mind going into town again but I didn't really see the point. She'd already picked up what she needed and a coffee while she was in town and I had cramps anyway. Jann ended up sleeping most of the day while Eva and I mooched around online as usual. My obsession with Breyer Horses led me to a game called Star Stable. Basically you ride around on a horse doing quests. I'm living for it right now. The time for Jann to leave came faster than expected. The couple of days really flew in, despite not really doing very much. I think she had a nice, restful time. Probably just what the doctor ordered with how busy she is with university. Becoming a nurse ain't easy! The rest of the evening was spent playing Star Stable and later on Eva and I watched The 100 before heading to bed. I had breakfast by myself on Tuesday as Eva was at work. I had hoped to be blog productive but I just couldn't face writing. I ended up being productive in another way. I recently started on one of the items on my bucket list. I'm going to crochet blankets for an animal rescue called Jemima's Place Animal Trust. I'm not super fast at crocheting so it will take me a while but I've made a good start on the first blanket. So on Tuesday I worked on it and watched a new series on Netflix, Open Heart. It's a Canadian teen drama/mystery series. Some of the same people involved in Degrassi are involved in it, as well as some of the actors. Which is what drew me to it. 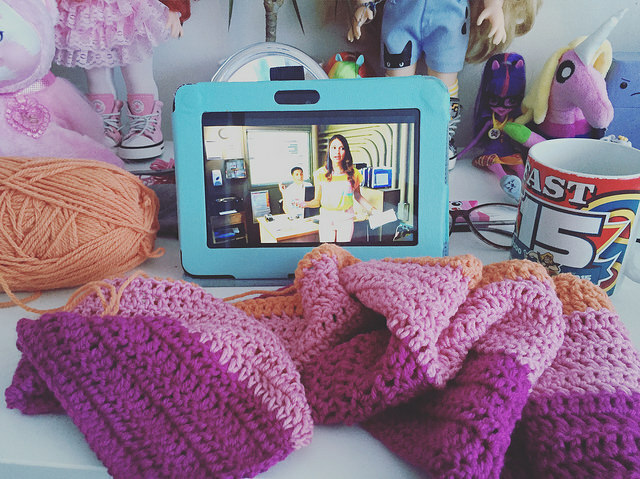 I ended up getting a lot of crochet work done as I watched all twelve episodes of the first series. I could have continued only for the fact there only is one season. I wasn't feeling very well in the evening so I didn't really do much. I decided resting up for my big birthday shopping spree on Wednesday was the best course of action. I chilled online before Eva and I eventually got into bed to watch stuff.Naturally I talked Eva into watching the first couple of episodes of Open Heart. Wednesday was my Birthday! My 26th birthday. I can barely believe it. Feels like just yesterday I was a teenager. Time needs to stop, for real. But I digress, for my birthday I got money towards my shopping spree from Eva, my parents, my aunt Karen and my grandparents. 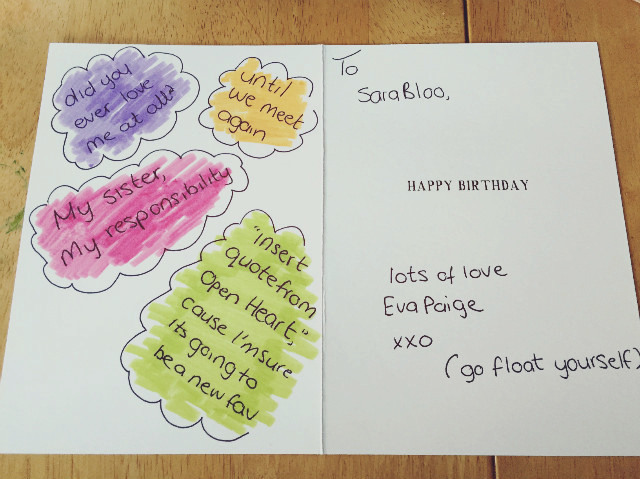 As well as some lovely cards from them too. I also got a card from Sylvanian Families as I have a subscription to their magazine, which was super cute! 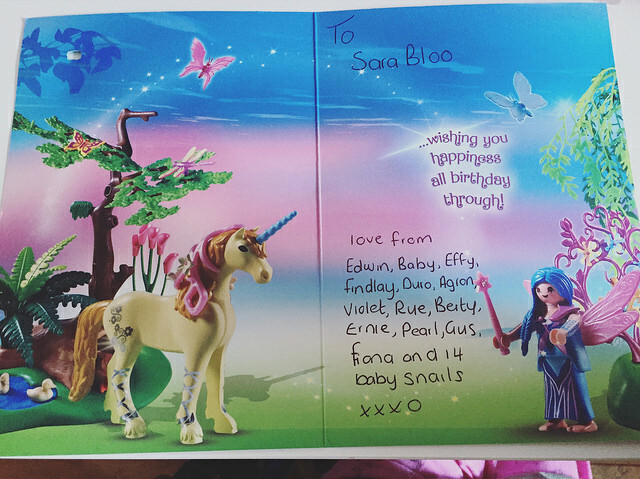 Oh and not to mention my card from the pets. How cute is that? After opening my cards and having some breakfast I got ready to head to Belfast with Eva. We made it just in time for the 1:30pm train but weren't sure we'd be able to get on as there were two big scooters in the tiny wheelchair area. I don't know why they don't have more than one. The train had also stopped so the door to the wheelchair area was in front of a bench so the conductor had to get them to move the train but eventually we got on and were on our way. We decided to go to Lee Garden to get dim sum first. I was really looking forward to it. We got our usual favourites as well as a new one to try, which I didn't end up liking. 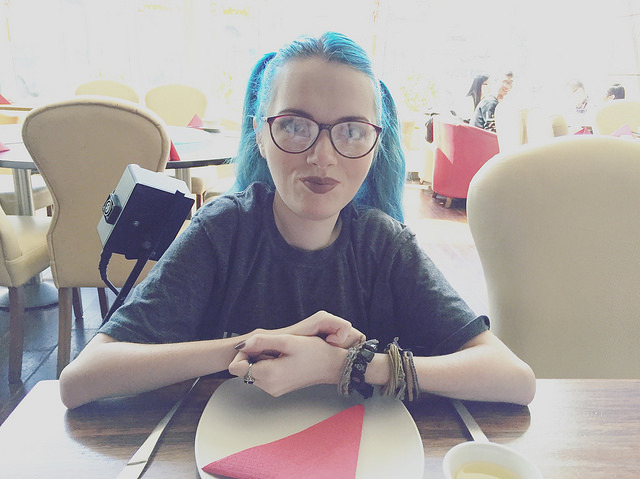 We ate and chatted and generally had a really chill and lovely lunch. Lee Garden never disappoints and the staff are so friendly. I can't recommend it enough if you're ever in Belfast. Once we finished our lunch we headed to do our shopping. 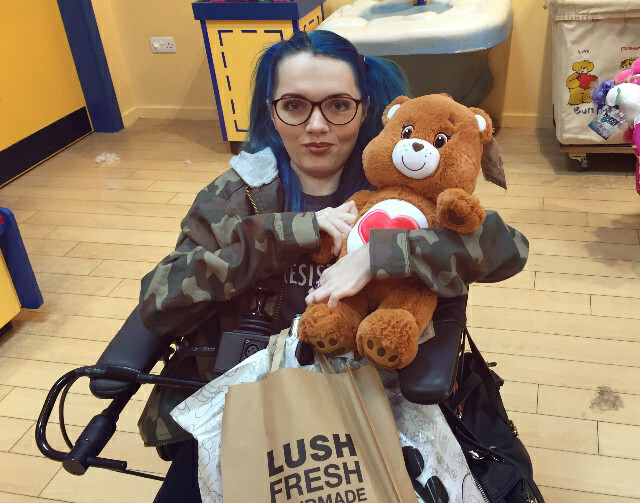 We went to Disney Store, Lush, Forbidden Planet and Build A Bear. Lush was the only store that I didn't make any purchases in. I spent an absolute fortune and I have no regrets. It was awesome. I encouraged Eva to treat herself too as it's no fun buying stuff on your own. Okay, it's still fun but not as fun! I even treated Eva to a Build A Bear as it didn't feel right getting one on my own. 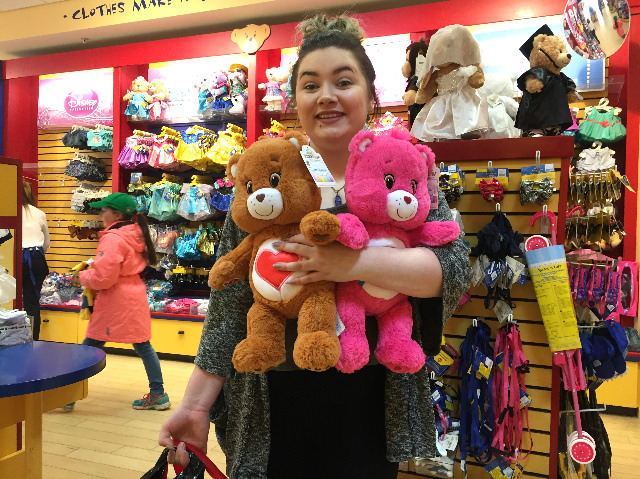 I didn't take too many photos of the day but here's some from Build A Bear. I got Tenderheart Bear and Eva got Cheer Bear. I sort of wish I got both now if I'm honest but I'd already spent a fortune by the time we got to Build A Bear. We opted out of getting any clothes as we didn't want to cover up their tummies. After buying our bears we headed back to the train station. We thought about having coffee but Eva was carrying super heavy bags and I was loaded up like a pack mule, so we figured it was best to get home before Eva's arms fell off. When I got home I was greeted outside by Findlay Wilder Reid. Perhaps he knew it was my birthday? In Forbidden Planet Eva and I were ecstatic to find they had an abundance of Funko Mystery Minis in stock. I had asked a week or two ago on Twitter and they said they were out of stock, so I was super happy to find they had so many I wanted. Naturally we bought loads! We weren't long home before we sat down to open them. I'd have loved to have saved some to open on camera for my YouTube channel but I was too excited to wait. Eva and I had twelve Mystery Minis to open each and it didn't take us long getting through them. There was a little bit of a come down after. I can't wait to get more! I haven't written a post on my toy blog about which ones I got yet. By the time we had finished opening all our blind boxes I was pretty beat and had a pretty bad headache. 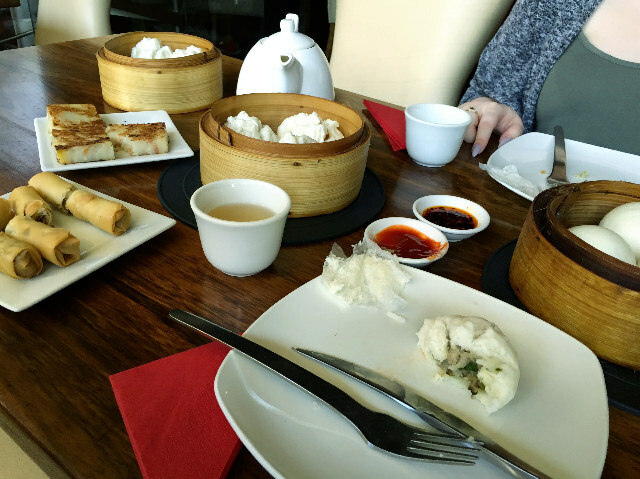 I figured the best way to finish off my birthday was to eat the dim sum we had brought home - because we'd ordered too much - and then get into bed with Eva and watch The 100 until the early hours of the morning. Eva was off on Thursday so we ate breakfast together while we watched stuff. A little later I was sort of productive. 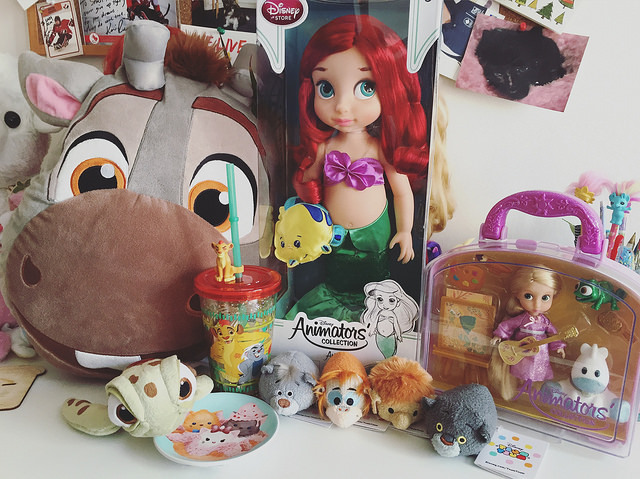 I tidied my room and took toy blog photos, including this haul photo of all the stuff I got from the Disney Store. Told you I was good to myself. Anyway, after taking blog photos I carried on my cleaning. I even vacuumed for the first time! It was a little difficult because our vacuum is super small so I couldn't reach everywhere but Eva was nice enough to help me out. It was something of a novelty doing it myself though but I'm sure that will ware off. Later in the evening my productivity continued as I sorted out my snails. I also noticed that the babies - at a week old - had started to change. They all had full digestive systems, so I knew they were eating and some had started to develop very light stripes. However the most interesting was one of their body's had darkened. It's so interesting seeing them change and how fast it happens. You can sort of see the darker one in the middle of this photo, closest to the lettuce on the right. The rest of the evening I chilled before heading to bed. Eva had to take Friday off work so we spent the day together. Despite starting to play Star Stable earlier in the week, Friday was the day I became fully obsessed with it. Rather than being productive and doing blog work I spent a lot of the day playing the game. I didn't feel well anyway and had trouble concentrating enough to write. Does anybody else find it harder to concentrate around their period? Later in the day I did finally get the latest edition of My Week In Words finished and scheduled, so the day wasn't a total lost cause. In the evening I watched YouTube and chilled online. I took part in the Stationery Bloggers chat for the first time and it was awesome. I learned a lot about Bullet Journals and I'm thinking of making the switch from my Filofax. If you have any Bullet Journal related posts I'd love you to link them in the comments! My Week In Words was posted on Saturday and if you missed the last instalment you can find it here. 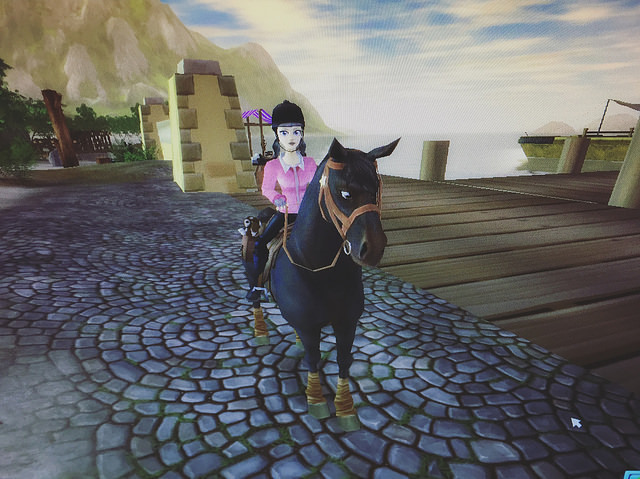 Eva was off again and once again we spent a lot of the day together playing Star Stable. I was in a lot of pain and knew my period was imminent. I was surprised it hadn't appeared already with the amount of pain I'd been in all week. Later in the evening I knuckled down and wrote my birthday haul post on my toy blog and despite starting super late I was able to get it posted before I had to head to bed. While I wrote I watched a live Pittsburgh Penguin's Playoff game. Last year I didn't catch any of the Playoff games. I have to say it's mighty good hockey and particularly since the Pens won. Sadly on Saturday I noticed that one of the baby snails was very retracted, considerably smaller than the others and also hadn't eaten. The rest were full of lettuce and active. I named them Alice and although I eventually found their heartbeat and had hope for a day or two, I'm sad to say Alice didn't make it. And that's pretty much my week. Aside from finding baby Alice gone and being in pain, I had an amazing week. I'm so glad I got to see my beautiful granny and my birthday was just awesome. I couldn't have asked for more. This was such a fun post to read! 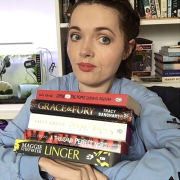 I find it so interesting to read about how other people spend their days :) It's kind of comforting to know that I'm not the only who can't face writing sometimes. 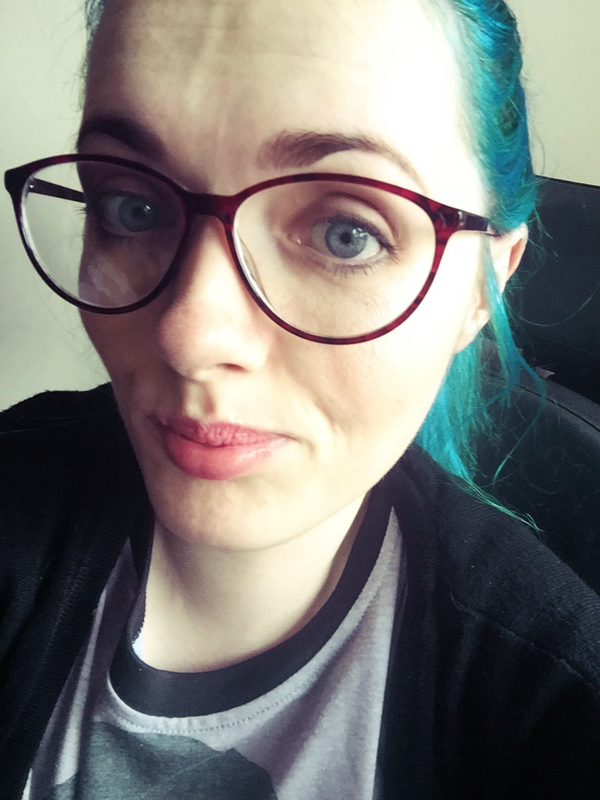 Having fibromyalgia & mental health conditions makes it so difficult for me to maintain a blog sometimes, and I hate when I have days where I have a blog post planned and I just can't get it written no matter how much I try! I'd love to see your blanket when it's finished, I really want to learn how to crochet :) It's fantastic that you're going to make them for an animal rescue. Happy (late) Birthday! It sounds like you had a lovely day. 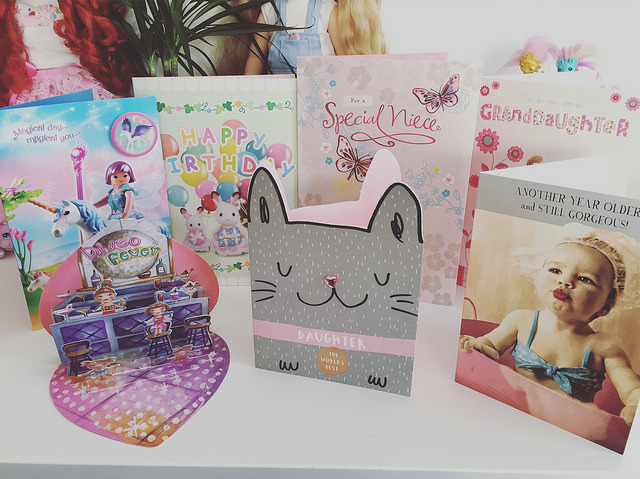 The sylvanian families card & cat card are so cute. 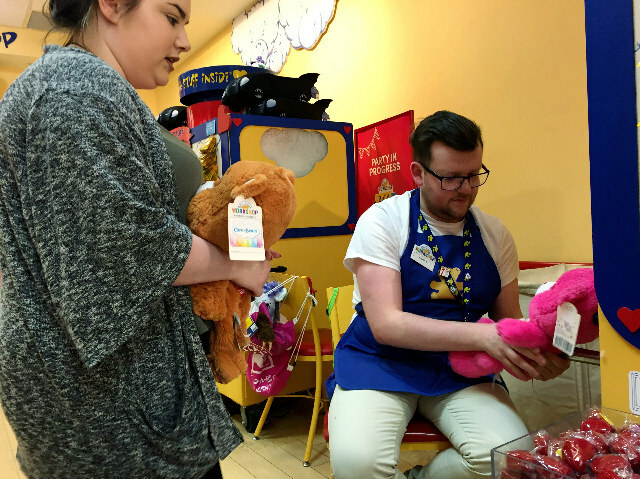 I absolutely love the Build A Bear workshop. I haven't been to a store for a long time since there isn't one in my town :( I have a gorgeous hello kitty one & a bunny which I dressed in the cutest PJs. 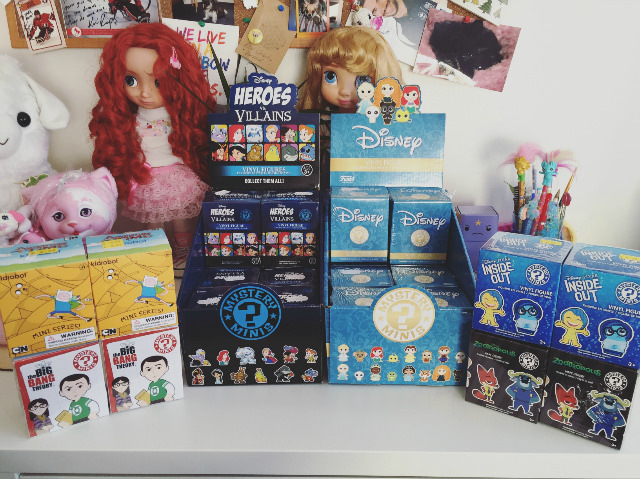 Awesome that you got so many blind boxes! I'm especially looking forward to see which characters you got inside the blue Disney boxes. I really wish there was a Forbidden Planet in my town! Love the tsum tsum plate you got from the Disney store, and those Jungle Book tsum tsums are really sweet! I need to add some of my own collection. Awww, I love GALS :) I'm excited to see more updates on them as they grow. Yeah, I'm going to have the first of three blind box posts up tomorrow! So long out for that. :) Again I'm lucky Forbidden Planet isn't too close. It would really make saving even more difficult. LOL.